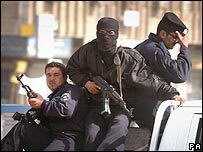 Gunmen have kidnapped and killed 17 policemen near the southern Iraqi city of Basra, police sources have said. It is believed 15 of them were trainers instructing new recruits at a local police academy. Two were translators. Their bodies were found scattered around Shuaiba, a town near Basra, some hours after their bus was ambushed. Correspondents say the killings will be a major setback to British plans for reducing the power of various militias in the area. The minibus was taking the men from the police academy, which is under the supervision of British forces to Basra, 12km away, according to Reuters news agency. The bus was ambushed by armed men at around sunset on the outskirts of Shuaiba. They were shot in the head and chest. Basra police say the vehicle did not have armed protection, which is common in Iraq. The BBC's Hugh Sykes in Baghdad says this latest incident is part of a pattern of attacks over the past week in which 50 Iraqi police and soldiers have been held up and killed. Translators and other personnel who leave military bases or police stations are vulnerable to attack by anybody who watches and waits for them, our correspondent says. This menacing problem is at the heart of the tension between Washington and Baghdad, he says. The Americans have been increasing pressure on Iraqi Prime Minister Jawad al-Maliki to neutralise the militias. President Bush has said US patience is "not unlimited" and a timeline has been suggested of between a year and 18 months for the Iraqi government to establish its authority. Mr Maliki says he could deal with the militias in six months if the army and the police had better weapons and training.